Hello friends and happy Friday to you! I have some exciting news to share with you today! I will be leading a workshop in Morocco from October 16-23, 2010 for an intimate, private group of 10 at the brand new and ultra exclusive Peacock Pavilions owned by Maryam Montague who authors the My Marrakesh blog and who is a professional shopper and soon-to-be book author. 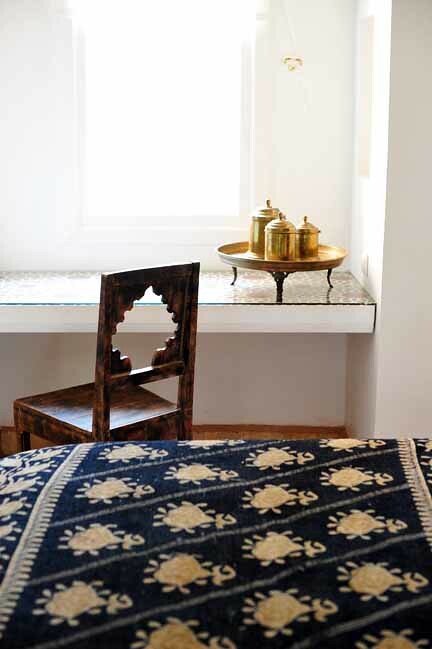 Here is a tiny glimpse of one of the ensuite guest rooms where you may want to rest your head after a dip in the pool, a henna party, rooftop dinner at sunset, drinks on the terrace, creative workshops focused on decorating and also blogging and creativity, or a shopping adventure in the souks of Marrakesh with Maryam and I (Maryam will take us to hidden gems, where she sources her finds). "There are 5 ensuite bedrooms at Peacock Pavilions. Each has an entirely different personality. This one is called The Room of the Golden Gazelles. Although you see it with a double bed here, all the rooms can have 2 single beds, too." 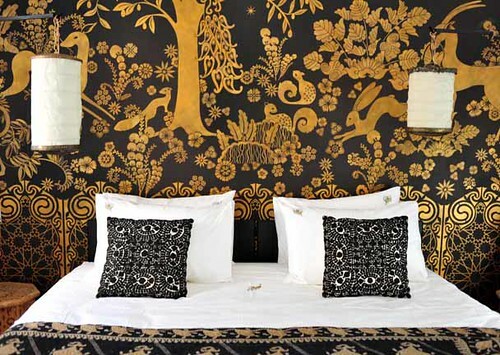 "The inspiration for the room was a screen that was in Lanvin's apartment in Paris. I saw it in an auction catalogue my parents sent me (they are auction addicts) and I sent it to Melanie Royals at Modello Designs as inspiration for the wall that she would be painting with a group of painters. 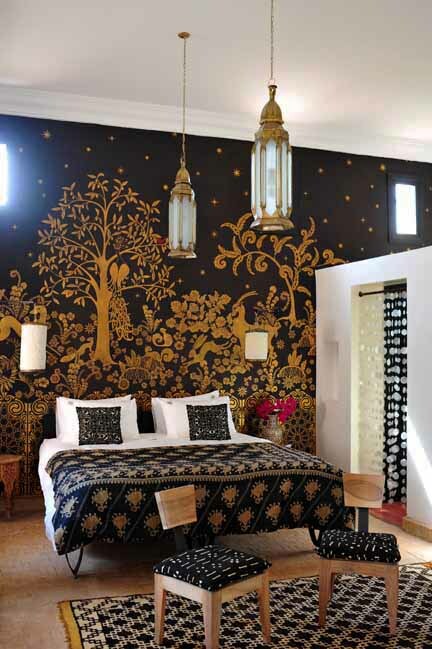 She then redesigned it -- adapting it to Peacock Pavilions, swapping out the tree for an olive tree, adding a dado at the bottom to act as the headboard backdrop, adding stars and flowers that she designed herself." 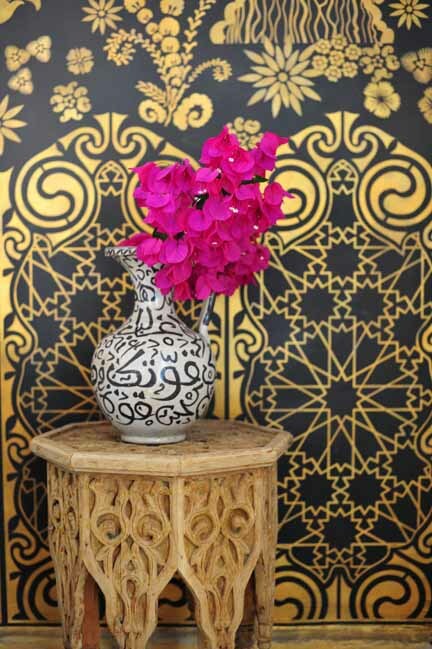 "My goal was to create a room with a glamorous feel and as you can see I have decorated it all in shades of gold/brass, black and white. 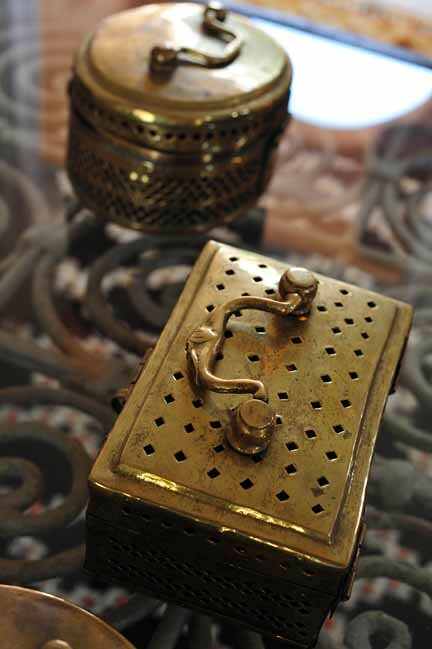 The room is filled with some antique and vintage treasures from Morocco and further afield." Now would you like a peek in on one of the bathrooms? 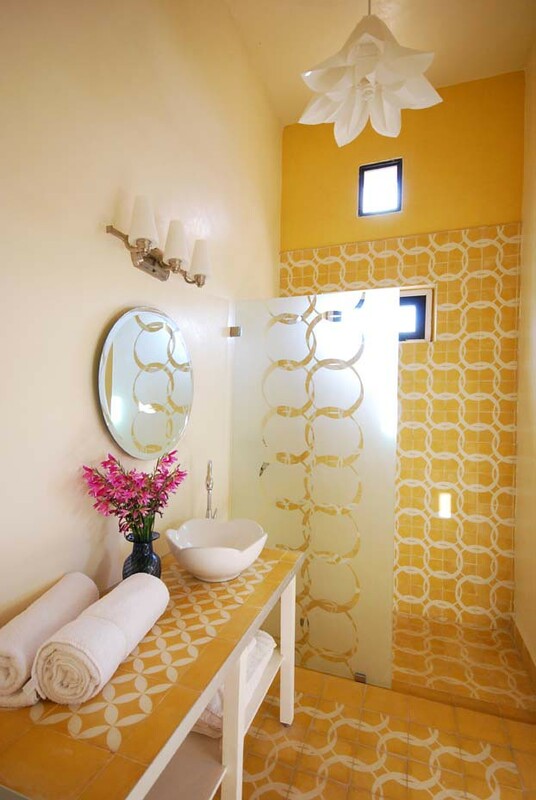 "This sunny yellow bathroom is all about yellow and white with a splash of pink. It's a bathroom that is designed to lift your spirits and was designed on a budget. 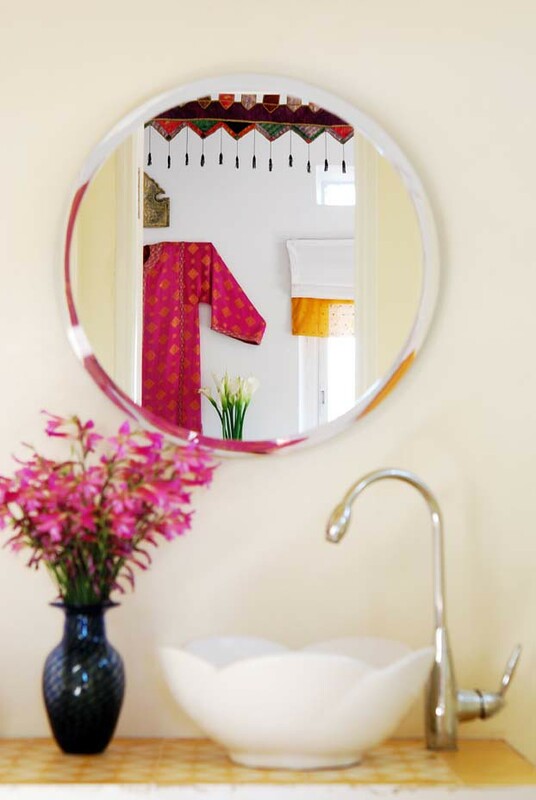 We made the vanity ourselves using a Moroccan yellow tile I found locally with a modern floral pattern. I found a little porcelain sink with a flower shape and a faucet that looked like a flower stem. I then put together a small Norman Copenhagen flower pendant lamp. The floor tile is from Popham House Design. I picked up the pattern from the tile, enlarged it with a stencil and had it sandblasted on the glass shower door. Besides the yellow walls, the rest of the walls are done in a glossy, burnished ivory tadelakt (like Venetian plaster) that makes the whole room glow and bounces the light around. " And this is just a glimpse of the magical pavilions where we will be staying... It will be a most enchanting + lovely time... I hope that you will enroll and join us on this exciting adventure. 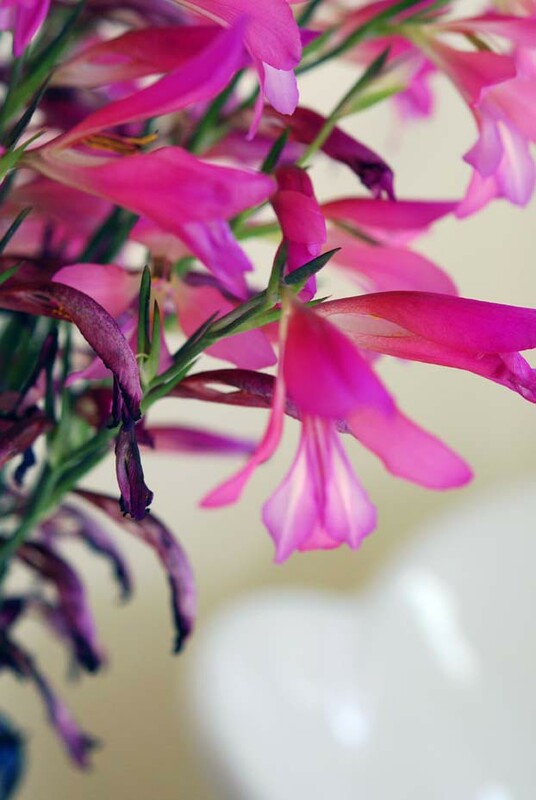 I can't wait to join Maryam -- we've been friends since I started this blog as she was one of my first readers so to meet her will wonderful for me. Her is the full schedule and trip details, cost, etc. There is a special offer to those who can pay with a check for a discount until June 30. They will receive $147.00 off the total price. Registration is extremely limited -- only 10 can enroll -- I wish I could enroll all of you though, imagine that! !